9/24/2015 - This is a story of conservation success, teamwork between two zoos and international partnerships—but it all started with some crocodiles. Matt Eschenbrenner, supervisor of herpetology at the Albuquerque BioPark Zoo, and colleague Ralph Zimmerman, head veterinarian, embarked on a 19-day journey across the globe in January 2014. Their destination was the Zoo National d'Abidjan (ZNA) in the Ivory Coast. Their mission was to help save the critically-endangered West African slender-snouted crocodile. To fully understand the story of the West African slender-snouted crocodile you have to back up—millions of years. About 8 million years ago, the Earth was going through violent and fiery change along the Cameroon Volcanic Line—a mountain range formed. Through the work of Matthew Shirley, Ph.D, herpetologists and conservationists now know that slender-snouted crocodiles were separated on either side of this mountain range. Since then, these two crocodile populations evolved into separate species with very unique traits—West African (Mecistops cataphractus) and Central African (Mecistops sp. nov.) slender-snouted crocodiles. Recent surveys show a grim reality for the West African variety, with fewer than 50 confirmed in the wild. It's the least-known crocodile on Earth, but it's also critically endangered due to the bush meat and leather trades, large-scale habitat destruction and competition for fish with artisanal fisheries (fishing nets also can entangle crocodiles). In the 1980s, a researcher named W.E. 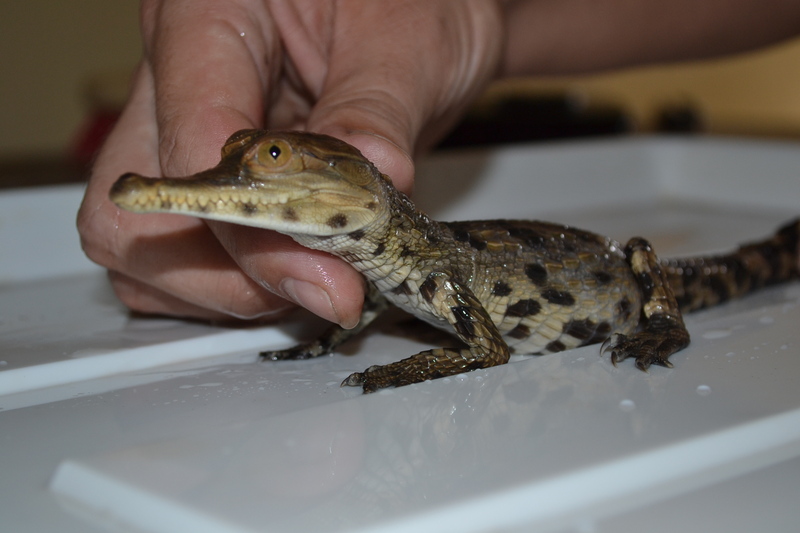 Waitkuwait brought eggs from the rare West African slender-snouted crocs to ZNA, offering a bit of hope for this rare crocodilian. However, fast forward to present day Ivory Coast, which endured two civil wars between 2002 and 2011—the fighting occurred just outside ZNA's gates. The war left the zoo in poor condition and many animals starved to death. This was bad news for the already endangered crocs. 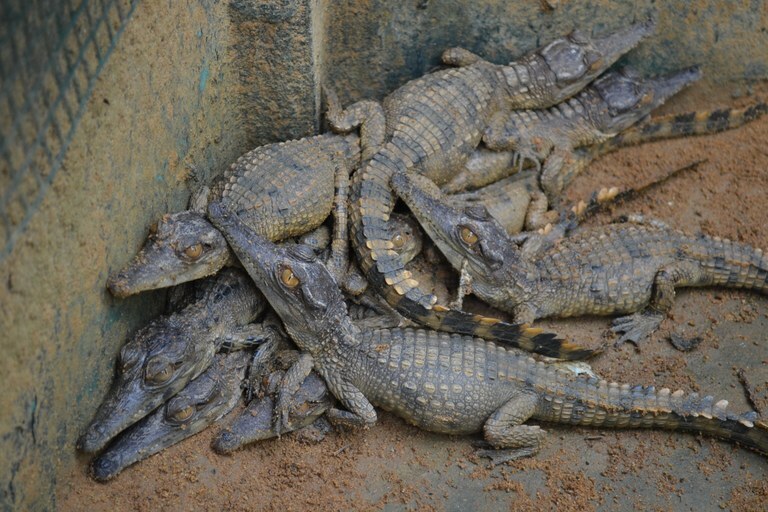 Although ZNA houses the world's largest captive population of West African slender-snouted crocodiles, breeding and care were problematic—with limited resources and training, zoo staff needed outside support. "They do not have the luxury of multiple zoos within the same country as we do—no place to visit and get ideas, no colleagues that they can e-mail, no classes focusing on animal husbandry," Eschenbrenner said. "They're also using old, beat up equipment they've been using a long time." Enter Eschenbrenner, who taught staff how to train and capture crocodiles. He and Zimmerman also tackled nutrition, as crocodiles were not getting proper nourishment. Breeding was an issue, so Eschenbrenner shared egg handling and storage techniques. Staff often handled the eggs during incubation, causing the embryos to move and drown. This was a simple fix—Eschenbrenner instructed staff to mark the top of each egg so that "up" was always "up." While local zookeepers lacked experience, they made up for it with enthusiasm, said Eschenbrenner. "One thing is for sure—they love their animals and the knowledge that was passed along was a huge step forward for them," Eschenbrenner said. "The croc guys were awesome. They were there every day working hard." All the tedious work and training was a success—less than 6 months after Eschenbrenner and Zimmerman's departure, 24 baby crocs hatched. "We were happy, jumping up and down when we found out," Eschenbrenner said. "This is great news when you have so few in the wild—they deserve all the help we can give." While this partnership started with a focus on crocodiles, it didn't end there. ZNA is looking to get back on its feet after struggling for years throughout the Ivorian civil wars. During their 2014 trip, Zimmerman inspected the majority of animals on the grounds. "I would just kind of go and jump in wherever possible," Zimmerman said. "Almost all of the animals at the zoo benefited from our visit." He also dispensed basic management advice to keepers, who were grateful for the help. "We got an amazingly good reception from the keepers. They were thrilled to have someone there to help them care for their animals," Zimmerman said. "They were doing the best they could do but they really never got any training, so anything they could get was helpful for them and the animals." Zimmerman delivered much-needed expertise regarding feeding procedures. After euthanizing a critically-ill female bushbuck that was "just skin and bones," Zimmerman's necropsy discovered an accumulation of plastic bags in her stomach—the death was the result of zookeepers tossing plastic bags full of food into her exhibit. Although her death was unfortunate, the posthumous discovery in her gut created a learning experience—the keepers now remove food from the grocery bags before feeding the animals. Zimmerman also addressed problems with the vervet monkey troupe. The troupe's dominant animals were devouring all the food while others starved—one monkey starved to death. Zimmerman suggested that keepers scatter food across the enclosure to ensure that everyone gets their fair share. In September 2015, ABQ BioPark staff veterinarian Carol Bradford, Kelsey Rowe, Clovis Perea, Chaz Moxley and Eschenbrenner returned to ZNA. Since the partnership began, ZNA has welcomed 50 new hatchlings. Bradford administered parasite checks, physical exams and blood draws for the site's crocodiles, which revealed a healthy adult croc population. The juvenile crocodiles' habitat also had made leaps and bounds since Eschenbrenner and Zimmerman's initial visit. But the exams also revealed challenges all of the zoo's yearling crocs are male. BioPark staff hopes their recommendation of lowering temperatures during incubation will produce female hatchlings. The young crocodiles were also low on calcium and Bradford recommended more dietary improvements. Bradford said she has high hopes for the zoo's crocodiles, which she wants to ensure stay healthy. "I really, really hope to stay very involved with the crocodile program," Bradford said. 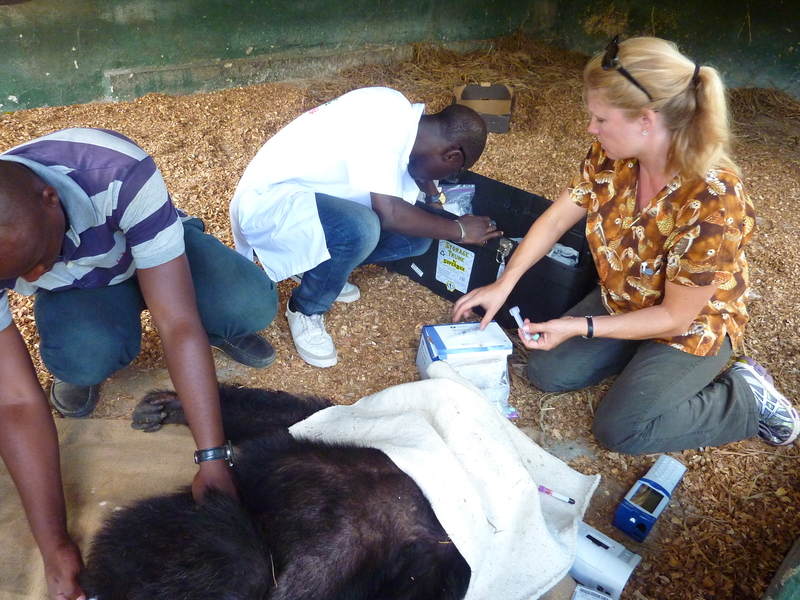 "With the success of the yearlings, I feel that the Abidjan zoo is staying on track." The next step for the yearlings is to get a taste of the wild life—Shirley is currently identifying suitable release sites in the Ivory Coast. This phase of the project will materialize when the young crocs become larger. As with the last visit, the BioPark team expanded to other areas of the zoo. Bradford investigated the pata monkey troupe—this once 14-member group is down to two very thin monkeys. Bradford discovered the monkeys were heavily parasitized, and she developed a deworming program and nutrition improvement plan. The BioPark crew also helped the chimpanzees migrate from a holding area to a new exhibit. Months earlier, the chimp enclosure collapsed on two sides and the holding area did not have readily available water—this made cleaning impossible and forced staff to carry drinking water twice daily by hand to the chimpanzees. "The chimp move was really big," Bradford said. "The conditions of the holding area were not good at all—not good for the chimps and very difficult for the keepers. The change will improve the overall health and wellbeing of the animals." In addition to the chimp relocation, Rowe helped the chimp trainer with social groupings so that compatible individuals are housed together. Moxley and Perea also offered expertise across the zoo—Moxley facilitated hoof stock and big cat training and enrichment, and Perea helped local construction staff spruce up the crocodile digs with a filtration system that supplies clean water. Throughout the civil wars, things were rough for ZNA zookeepers—during this time of chaos, they slept at the zoo near their creatures to ward off opportunists who were looking to kill and eat the animals. Although they still work six days a week—an extreme schedule by American standards—things are looking up. ZNA's assistant director attended AZA Croc School in April. He received a scholarship to pay for the trip to Florida and is the first attendee from Africa. ZNA also benefitted from new gear gifted by the BioPark crew—work boots for the crocodile keepers, work shirts, a camera, a tablet, a second reptile incubator and numerous veterinary supplies. But ZNA staff members weren't the only beneficiaries of the partnership. "For me it was a huge eye opener about how lucky we have it and I'm grateful for the things I have here at the BioPark—the resources I have," said Eschenbrenner. "It reminded us to put our noses to the grindstone and do what we're here for, which is taking care of the animals," he said. "When you see someone who really cares about their animals and who is struggling, it just makes you appreciate what you have more." Images from the ABQ BioPark's trip to the Ivory Coast.